Demeyere applies the technical concept of each product to the specific requirements of the typical cooking processes and recipes for which the product is used. The technical requirements of cooking, baking, stir-frying or frying are very different. The technical design and the materials used are adjusted to each type of product. Nothing is left to chance. 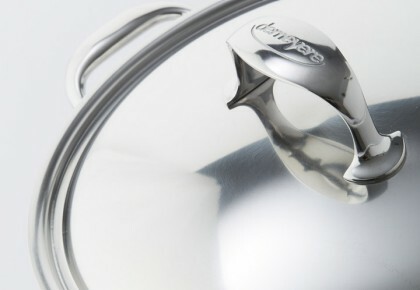 Demeyere cookware - art and philosophy. Silvinox is a unique electrochemical surface treatment system that enriches the material by removing any iron and impurities from the surface. This makes the stainless steel easy to clean, and provides a higher resistance to fingerprints, harsh detergents or strong acidic foods. The products retain their silvery-white colour, even after years of use. 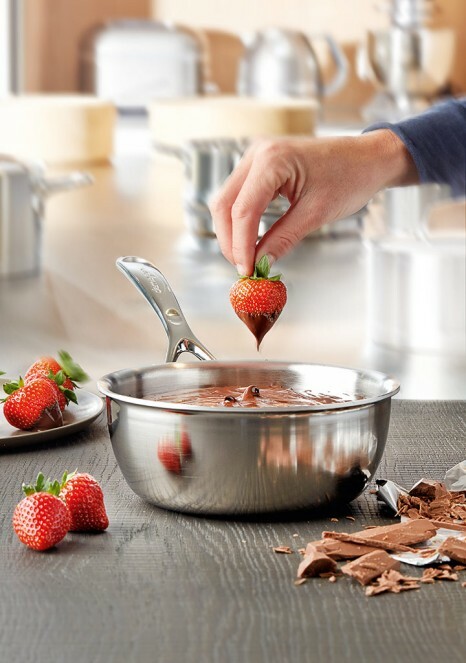 Cooking with Demeyere cookware is economical, especially on induction, thanks to the combination of superconductive bases, perfectly fitting lids and insulating sides. 7-PlyMaterial is a unique technology consisting of 7 alloys, including stainless steel and an aluminium core. This technology is used for both the product's base and sides and ensures optimum heat distribution up to the very edge of the product, allowing for perfect control over the cooking process. The 7-PlyMaterial reaches up to 30% more efficiency on induction due to TriplInduc. 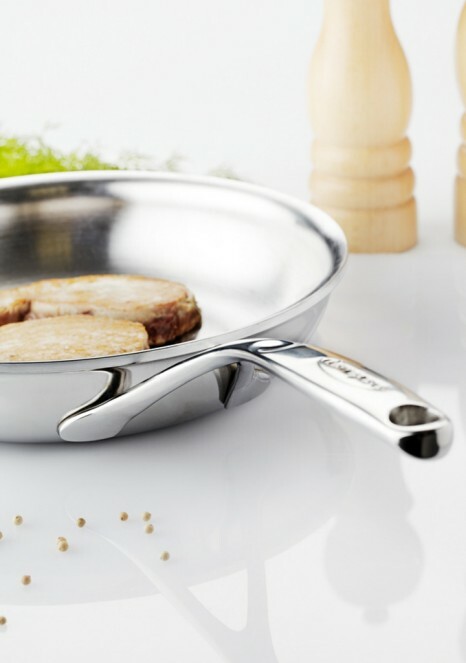 This special combination of different alloys, including aluminium, ensures that the heat is not concentrated in one place but is evenly distributed over the entire surface of the pan, right to the rim. 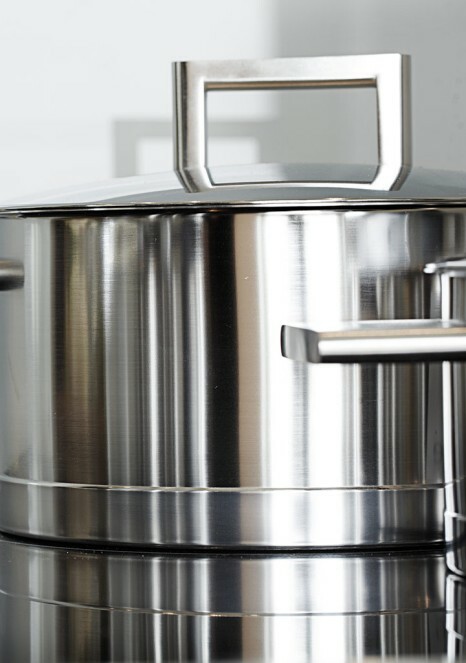 A magnetic stainless steel exterior makes these products suitable for all cookers, including induction. The InductoSeal® base consists of seven layers. A copper disk, hermetically embedded in the base, ensures optimum heat distribution and provides a heat-conducting surface which is 33% larger than a traditional base. InductoSeal® allows for controlled, energy-saving cooking on a low heat. The base capsule is welded to the underside of the vessel, providing excellent hygiene as water, fat or dirt cannot penetrate. The InductoBase® base consists of seven layers with a heat-conducting core of pure aluminium. This aluminium layer, with a thickness of 5mm, ensures there is an even heat transfer through the base, to provide optimum cooking performance, even on a low heat. 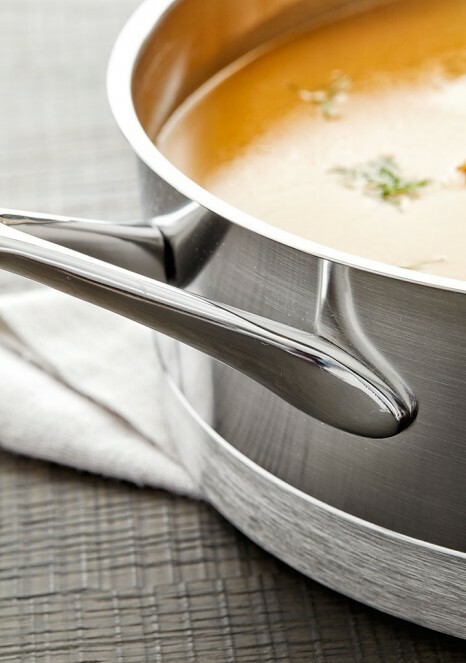 The products in the Resto by Demeyere range are made of 18/10 stainless steel and feature a 4mm thick capsule base. The base consists of three layers: a stainless steel interior, a 3mm thick aluminium plate for good heat conduction in the middle, and a magnetic stainless steel exterior. 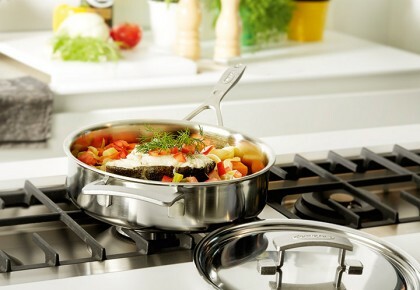 This means the cookware can be used on all types of cookers, including induction. 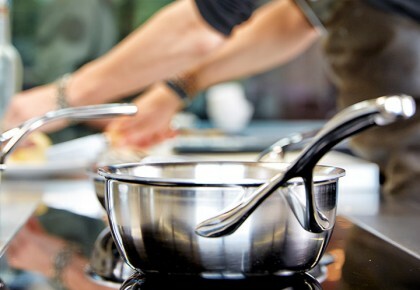 Even more than with other systems, the quality of the cookware is essential when cooking on induction. 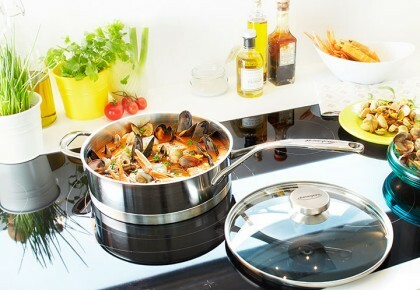 Thanks to the unique combination of materials and technologies, cooking on induction with Demeyere cookware is even faster, even safer, even more easily regulated and even more economical. Induction cookers develop a very intense heat in a very short time. In order to maintain the ideal frying temperature, Demeyere has developed pans with ControlInduc®, a safety system that limits the maximum temperature of the frying pan to 250°C / 485°F on induction cookers. Until about 220°C / 425°F, a product equipped with ControlInduc heats normally, but above this temperature the power of the inductors is automatically and progressively decreased by the ControlInduc® system until it stabilises between 245°C / 475°F and 250°C / 485°F. When, for example, one puts cold or raw food in the pan, the cooking surface cools slightly. Recognising this drop in temperature, the ControlInduc® system automatically re-engages the pan with the inductors until the desired temperature is reached. And if a ControlInduc® pan is left on the induction plate it will not overheat. Induction needs contact with a magnetic surface to create heat. The unique alloy on the base of ControlInduc® pans loses its magnetic properties above 250°C / 485°F meaning it can never overheat. TriplInduc is a unique combination of three alloys that provides up to 30% more efficiency on induction. Furthermore, it ensures that the base remains flat, allowing you to switch from one heat source to another at any time. 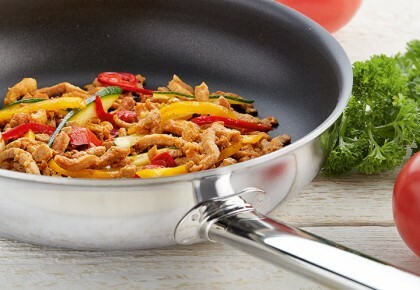 Demeyere offers you a choice from a wide range of frying pans: with or without coating. 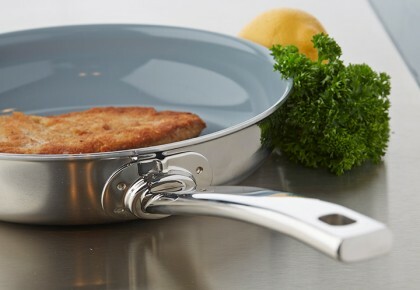 All frying pans are very user-friendly and easy to clean. This innovative ceramic coating is PTFE and PFOA-free and does not emit toxic gases when frying at high temperatures. Good non-stick properties up to 200°C, combined with extra high scratch resistance for golden brown frying results. This latest generation of non-stick coatings contains 3 layers for improved wear resistance. Safe to use up to 230°C, but not under the grill. The traditional non-stick coating for easy frying. 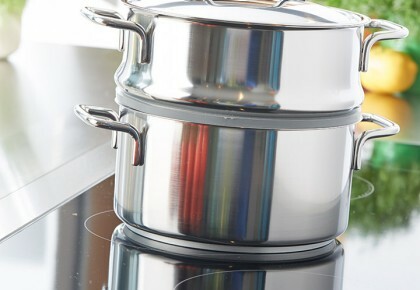 The Demeyere lids are a perfect match for cooking pots and therefore have excellent sealing qualities. 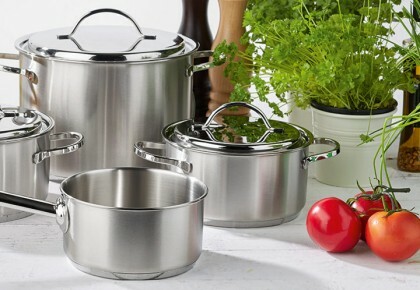 The lids can be switched among all pots and pans of the same diameter. A good lid prevents loss of heat and energy. 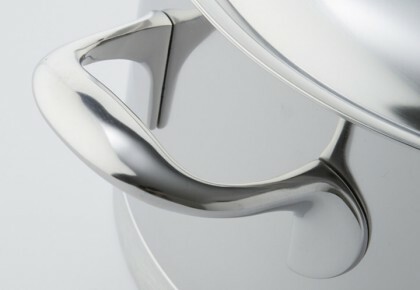 Thanks to a unique welding technology, the handles are extra securely attached and extremely hygienic as there are no rivets. This prevents water and fat ingress and a build-up of dirt, grease and germs. 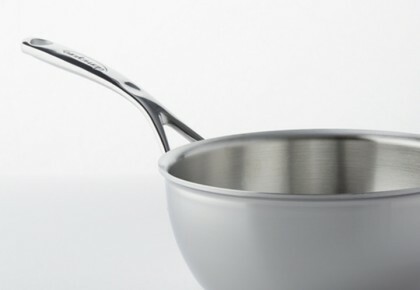 The edge of the pan is moulded into a special shape, so that you can pour out liquids with a low viscosity (such as water), as well as thick sauces, without spilling. This does not apply to conical models in the Apollo series.